You and your colleagues will enjoy an improved screen-sharing experience with the Video-based Screen Sharing (VbSS) capability added to Skype for Business 2016. While you won't see any changes in the way you present on-screen content during your meetings, you will notice that the connection time is drastically reduced, and the screen presentation is always in sync between presenter and viewer. Not only is VbSS faster, but it also more reliable and works better in case of low network bandwidth conditions. Note: VbSS is only used when all participants in the meeting are using the latest version of Skype for Business 2016 client, and conference VbSS is enabled on servers where your meetings are hosted. If these conditions are met, your screen-sharing session will automatically start with VbSS. If they are not met, your screen-sharing session will automatically start with Remote Desktop Protocol (RDP) rather than VbSS. See version requirements. 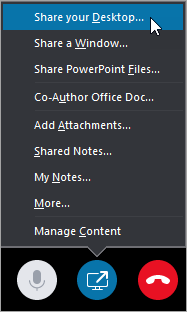 In the meeting window, click Share Content . Choose the monitor to present. You'll notice the familiar screen-sharing UI show up on the selected monitor. And remote participants in your conversation will see it. Note: Don't see this feature in your Skype for Business client yet? Stay tuned. It will be rolling out to you in an upcoming Office 365 update.